Until fairly recently, a sundowner was what we enjoyed as our group of friends gathered around a campfire in some isolated places on this most beautiful continent to recall, as well as re-live the highlights, laughter and memories that we had created that day. Together, with our travel companions we have journeyed to some isolated and breath-takingly beautiful places. 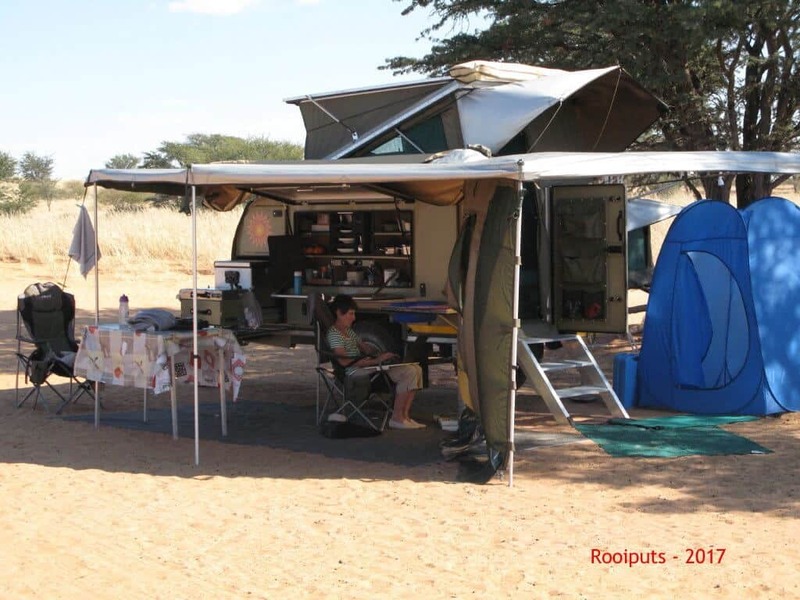 In our early years of exploration, we used a roof-top tent and then 5 years ago changed to a trailer with attached tent, in which we spent 330 nights and travelled 71 7o0 kilometres. In order to continue these adventures, as we inevitably age, and have our rather high expectations met, Malcolm and I decided to explore the off-road caravan options that were available. 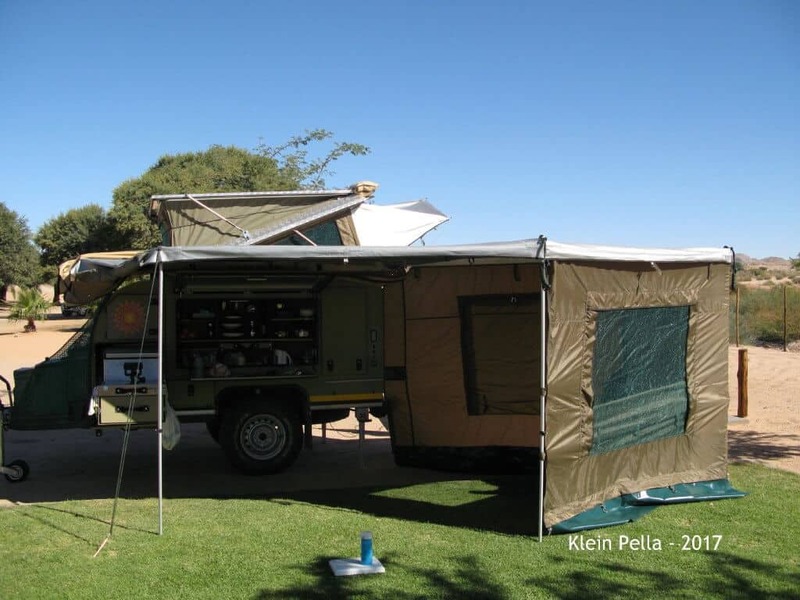 We visited the Kyknet Show, near Malmesbury, and spent a happy day examining all the makes of off-road caravans on show. 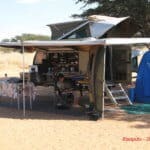 We chatted to agents; we discussed all the features that would suit our style of travelling and especially, which vehicle would extend our forays into ‘the bush’ as we age…gracefully. Malcolm, assimilated the technical information. 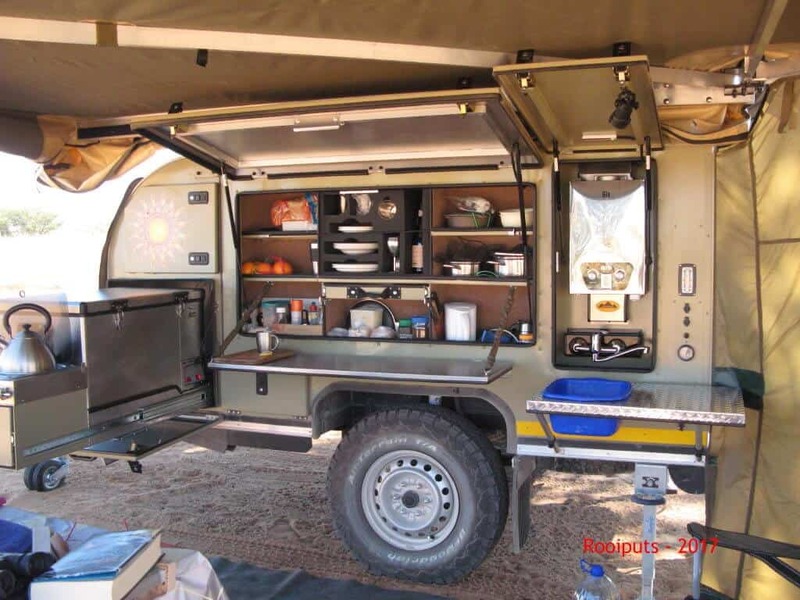 He was especially interested in chassis strength; having witnessed a number of off-road caravans needing repairs after travelling on some horrendous roads in Etosha and elsewhere. Malcolm wanted a unit that was well-built and would not rust, as we live at the coast. I knew instinctively what appealed and why. At first, we discounted The Sundowner as the kitchen area did not suit me. I am not very tall and it was obvious that I would struggle to reach the stove! However, Jaco said, “No problem, we have a solution” and within a week we were being taken around the factory by Jasper and shown how they could modify the unit for us. Suddenly, a sundowner beverage had become a Sundowner, one of Bushwakka’s off-road caravans. Our acquisition happened quickly, smoothly and without a hitch. On our trip to the factory, Malcolm took with him a fairly comprehensive list of changes and queries that he wished to address and Jasper listened with interest and respect. In turn, when he thought that Malcolm was not considering the advantages of leaving things as they were, we in turn, trusted his advice and opinion and for that we are not sorry. While our Sundowner was being manufactured, we received regular updates and photos of the progress, from Jasper and Bushwakka. The much-anticipated day of delivery arrived and a thorough hand-over was completed. In order to experience our new home-from-home, we camped near Worcester for the night. Jaco accompanied us to ensure the set-up was completed correctly and smoothly. The next morning, we returned to the factory where a couple of small glitches, that we had noted, were fixed and sorted out without a murmur by the men and women in the factory. My greatest niggle was that for a long trip, I would not have enough space for packing food, clothes and all the belongings that one needs to make camping a comfortable and happy experience. However, I was amazed and delighted by the small touches that I found in cupboards and drawers, we hardly even used all the storage space under the bed. Lights, in unexpected places and hooks where they were needed. This caravan has been designed with thoughtful touches by people who have camped and care. 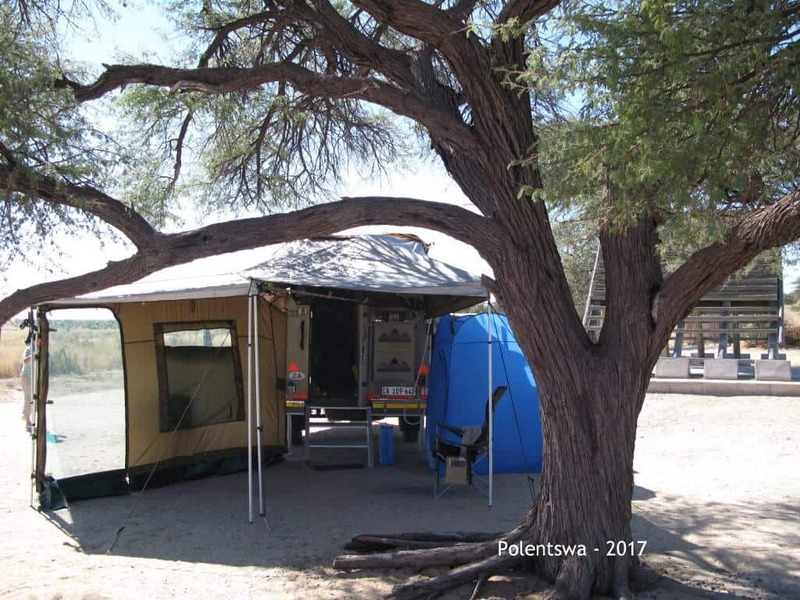 Apart from that first night in the Sundowner we did not have time to test it further before we left on a five-week-long trip to Kgalagadi, then out through Kaa Gate to Elephant Sands and Victoria Falls where our 14 year old granddaughter flew-in to join us. 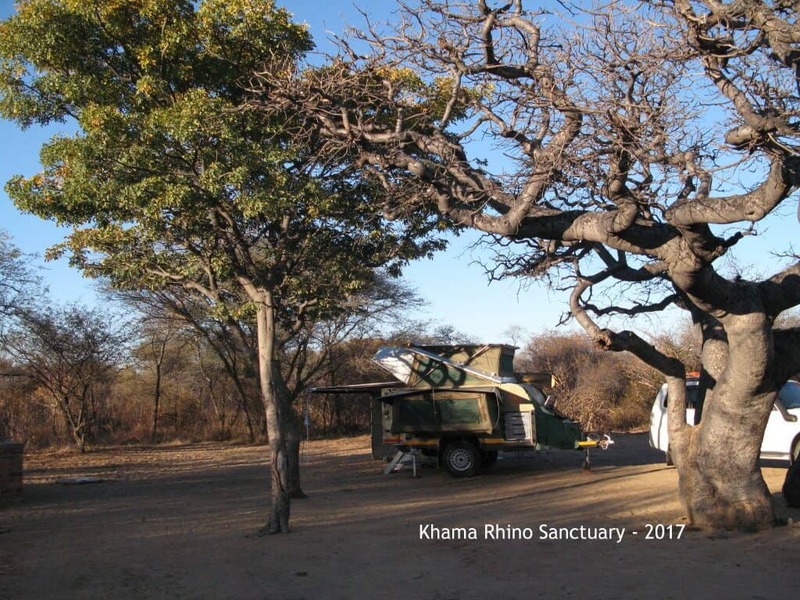 Together, we then travelled to Hwange where we were warmly received and where we enjoyed some stunning sightings of leopard, lion, wild dog and elephant, before completing the long haul back to Cape Town. 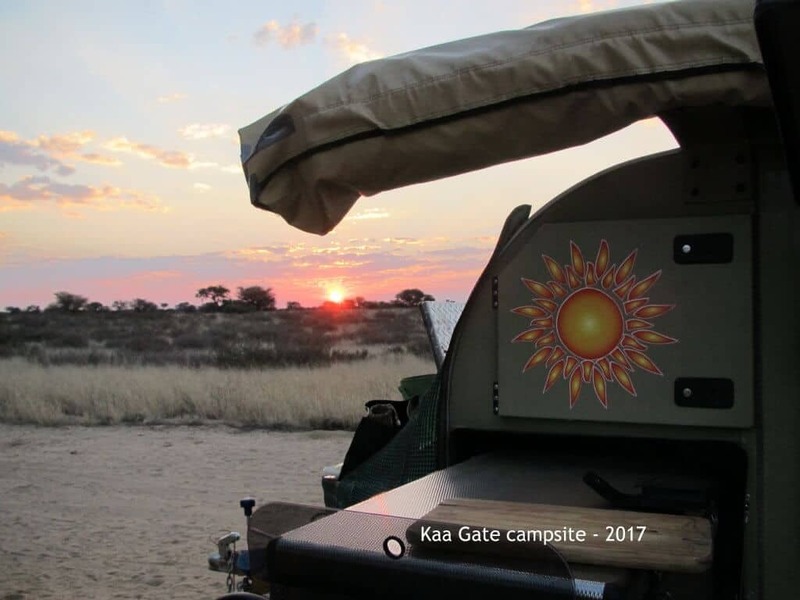 We thoroughly enjoyed the trip in our Sundowner, it towed well and the comforts that went with it contributed to the forging of unforgettable memories for not only us, but for Genna too. The Sundowner, proved to be the best choice for us, and Jasper, and his team, have proved to be the most amazing and professional group of people who have taken obvious pride in our delight. Thank you, Jasper, Jaco and the Bushwakka team too!